You have found the perfect place for a vacation to Breckenridge! 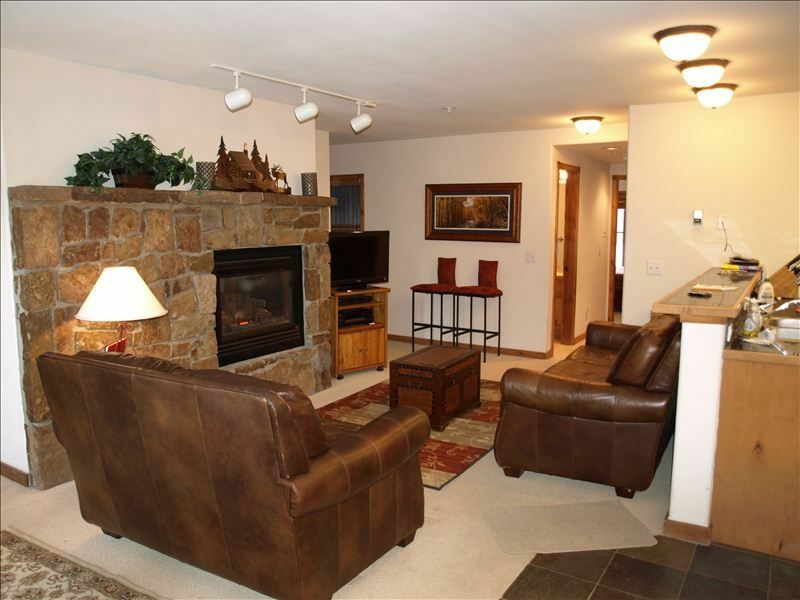 This 3 bedroom, 3 bath condo has ski-in/ski-out access to the Snowflake Lift. You will also enjoy being just a short walk into historic downtown Breckenridge with its many outstanding restaurants and shops as well as entertainment. This 3 bedroom unit at Los Pinos is spacious (sleeps up to 9) and has the feel of home. On the main floor is a newly refurnished, comfortable family room with a gas fireplace, cable TV and a deck off the back offering beautiful mountain views. The fully equipped kitchen and large dining area complete the living area. Also on this level are two bedrooms. The first features two sets of bunk beds, one with a double bed on the bottom, as well as a full on-suite bathroom. The second bedroom has a queen size bed, and there is a second full bathroom located just across the hall. The master suited is located on the upper level offering complete privacy. It has a vaulted ceiling, a balcony with mountain views, and a gas fireplace. The large master bathroom includes double sinks, a shower and a whirlpool tub. With this unit, you will have full use of the private heated garage with ski racks for convenient storage. You will also enjoy access to the on-site outdoor shared hot tub as well as the shared upper village pool. The unit also includes internet access and a washer and dryer. There are cable TVs located in all the bedrooms. Linens and towels are included. Don't miss the chance to have a vacation stay you won't soon forget! The free shuttle stop is just a block away, and can take you all through Breckenridge as well as connect to surrounding towns and ski areas. Heated garage plus 1 space on driveway. Expandable table. Able to accommodate 10 easily. Great for playing at as well! Perfect place to stay for a mountain getaway! We stayed at the condo with another couple and their 3 kids and there was plenty of room for us all. You can either do a short ski in/out to Snowflake lift, or hop on the Yellow line Breckenridge free ride bus for 1 stop to get to the base of Peak 9. We also took the bus into downtown Breck for a great dinner. Would definitely stay here again! Bunk room worked great for kids. The three bedrooms worked great for our two families. We had the teenagers and young adult kids share the bunk room and the parents each had a queen bedroom. The large dining table was very appreciated for our big group to gather around. The ski out to the lift was nice. Skiing in and the walk wasn’t to bad either. We would stay here again. Awesome owner, awesome property! Thanks Lori! This property provided us with the perfect place to enjoy all that Breck has to offer with our friends and family! The unit was fantastic and Lori the owner was very accommodating and effectively communicated everything we needed to know to make our stay first rate! House has everything you will need to cook & dinner. In addition a great place to eat & drink super close, walk distance & clean. Beautiful Home in the Best Location at Breck! Cozy condo - Excellent location! Stayed here with a group of six for a weekend of skiing and couldn't have picked a better place to stay. First off the homeowner Lisa was excellent to work with and very responsive and accommodating! As far as the location, its a 2 minute walk across the street to access snowflake lift and ski into grand timber lodge for a 5 minute walk back (or take grand timber lodge shuttle from any base location). Main street was only a 10 minute walk as well so you couldn't beat the location! The condo has a nice heated garage to store all our gear so we weren't having to store it inside which was great. Hot tub was a short walk and was nice after a long day of skiing. The condo was very clean and well furnished with cooking supplies. Bottom line I would highly recommend this place and i hope to make it back soon!